There are collectors and then there are collectors. And then there’s Virgil Elings, proprietor of the Solvang Vintage Motorcycle Museum. Is he eclectic or eccentric? Discriminating or indiscriminate? Crazy or crazy like a fox? Or all of the above? 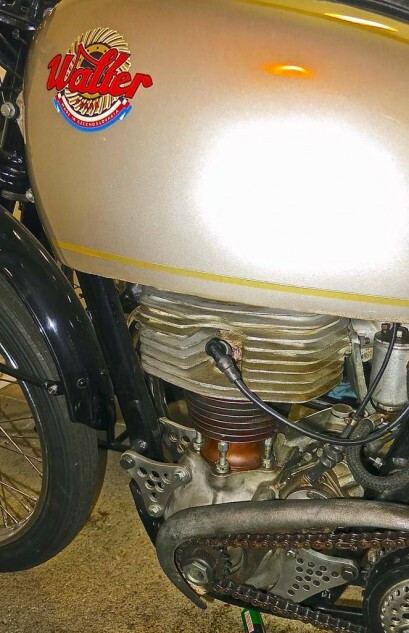 At age 16, after a frustrating experience with an Indian Brave, he traded it in on a BSA Golden Flash. “I had a paper route at the time, and made about $15 a week. So I made terms with the dealer to pay $10 a week on the BSA.” Dealer/customer relations were more relaxed in the Fifties. Virgil is always glad to chat about the machines in his care, and occasionally sells a few when he runs out of space. A native of Des Moines, Iowa, Virgil attended a technical high school (where he built his own drill press) and went on to study mechanical engineering at the University of Iowa, followed by graduate work in physics at the prestigious MIT (Massachusetts Institute of Technology). He completed his Ph.D. in 1966. The motorcycle habit continued, largely because “you couldn’t find a place to park a car in Boston.” For the next 20 years he taught physics at the University of California at Santa Barbara (UCSB), where the bikes included Triumph and BSA Twins, followed by a Honda Four, which gave way to a Jaguar roadster. On sabbatical in 1986, Elings and former student Gus Gurley created Digital Instruments, pioneers in the field of scanning probe microscopes, at the forefront of nanotechnology. With the company’s success, UCSB determined that it represented a conflict of interest for a professor, and asked that he divest himself of the business. Elings gracefully declined, quit teaching and 10 years later, sold the company for many millions of dollars. Many many millions. 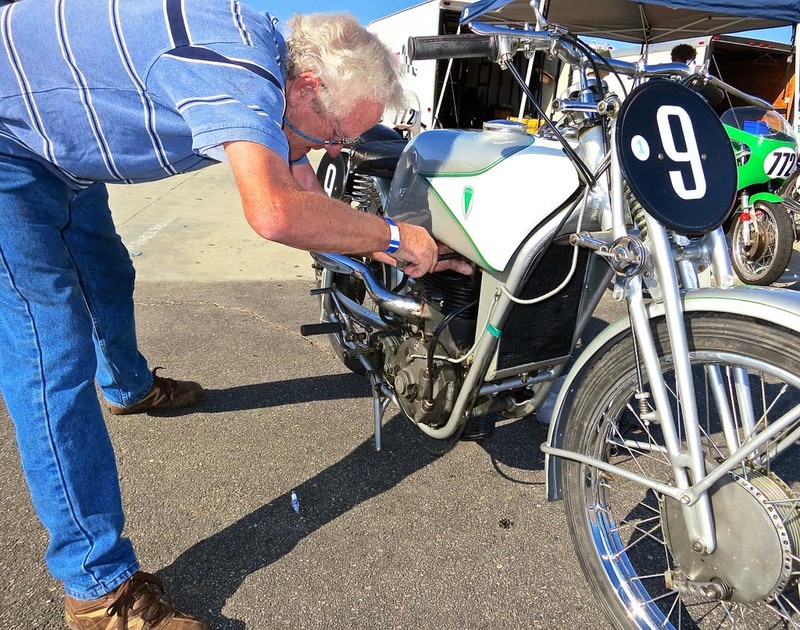 Jeff Elings gets set to race in the Corsa Moto Classica at Willow Springs while Virgil looks on. 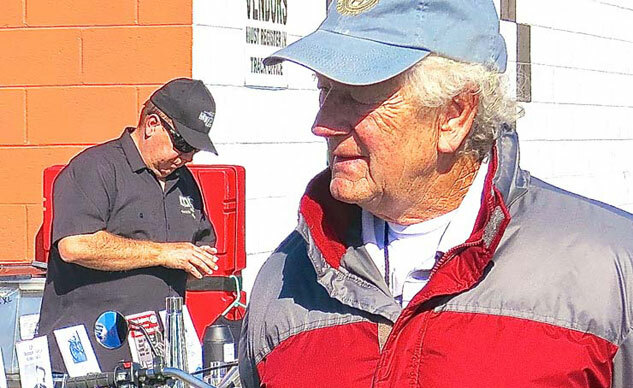 With time and money on his hands, Virgil and sons Mike and Jeff got involved in vintage motocross. They all did well as Novices, Jeff and Virgil both winning the west coast championship in their divisions. Jeff collected a National #1 plate in the Classic ’60s class. After a couple years they moved up to the Amateur class, “where we seemed to be a lot slower, so it wasn’t as much fun.” Instead, they decided to try roadracing. Virgil takes the 1953 NSU Rennsport out for a few demonstration laps. 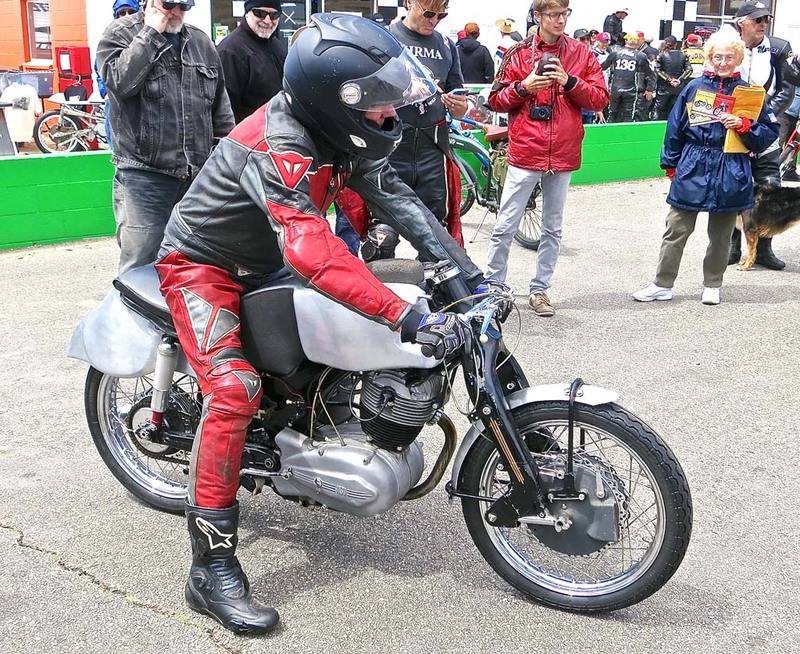 Virgil has since retired from active competition, but still wrenches for Jeff in selected regional events of the American Historic Racing Motorcycle Association (AHRMA). 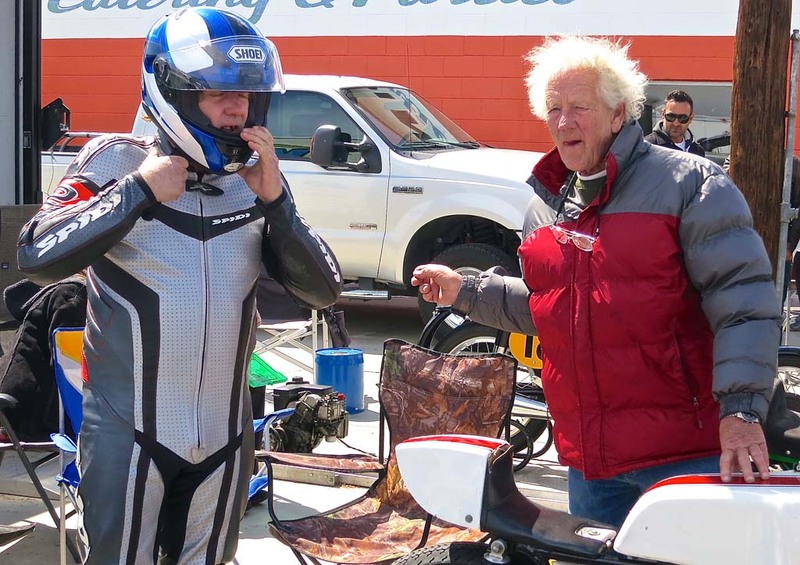 Jeff ran three classes at the recent Willow Springs Moto Corsa Classica and collected three wins on Saturday and three more on Sunday. “Willow has been my favorite track,” Virgil said. “You get a long view and there’s not much braking involved.” He still takes some of the rare machines out for demonstration laps at the races. The supercharged 1938 DKW 350 requires numerous plug checks. The fifth cylinder, on the bottom, acts as the pressure pump. Jaroslav Walter went to work for CZ in 1949. His father, Josef, began building motorcycles in Prague in 1902. While motorcycles represented fun and freedom in his student days, they now also serve Virgil as diverse examples of mechanical engineering and “a bank account I can enjoy.” A guided tour of the museum is a learning experience for even those with some background in moto-history, given the rarity of many of these machines. Elings obviously enjoys providing the commentary on such obscurities as the Mars, a customized Motosacoche and the Megola. “This is a Walter,” he says, indicating a single-cylinder bike in the shop area behind the museum. “He (Jaroslav Walter) went on to design all the CZ overhead cam stuff, and I don’t think there are too many of these in the world. The Pebble Beach guys are gonna allow us to bring it up and stick it in the show. I think most of the CZ four-strokes were race bikes only. 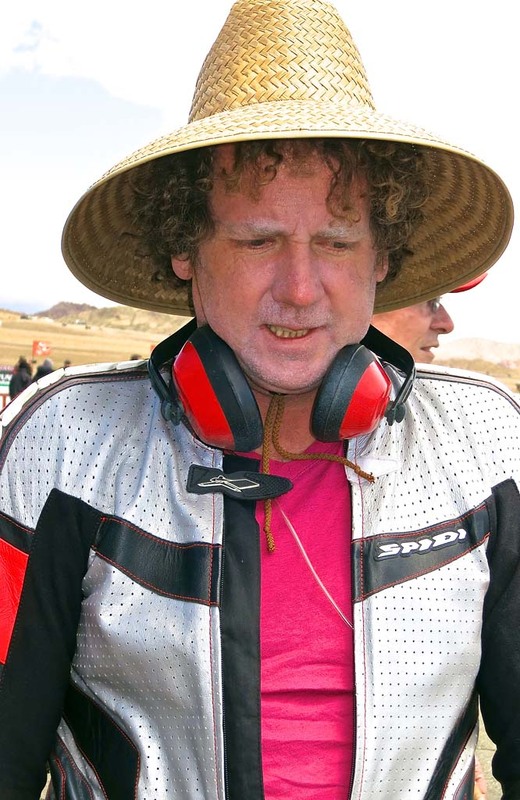 While the winds at Willow usually preclude sun hats, Jeff’s afro is sufficient to keep one in place. From 1966 to 1972, Giacomo Agostini won seven consecutive world titles on the MV 500 three. Eastern European motorcycles were featured at the Pebble Beach Concours d’Elegance this summer. In addition to the Walter, Elings displayed the DOHC CZ 125 with dustbin fairing and the 500cc Twin Jawa roadracer. 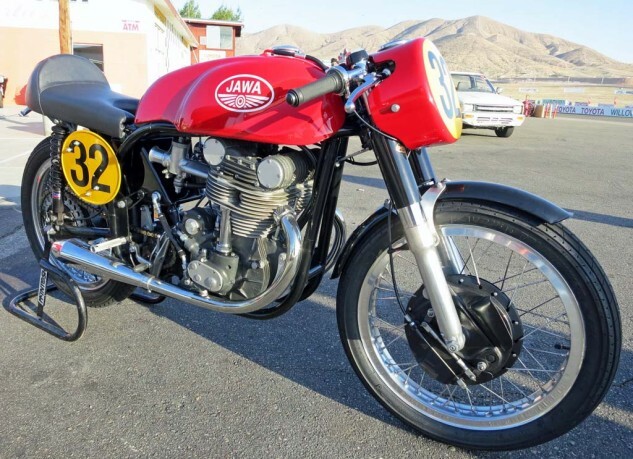 1960 Jawa DOHC 500cc Twin. 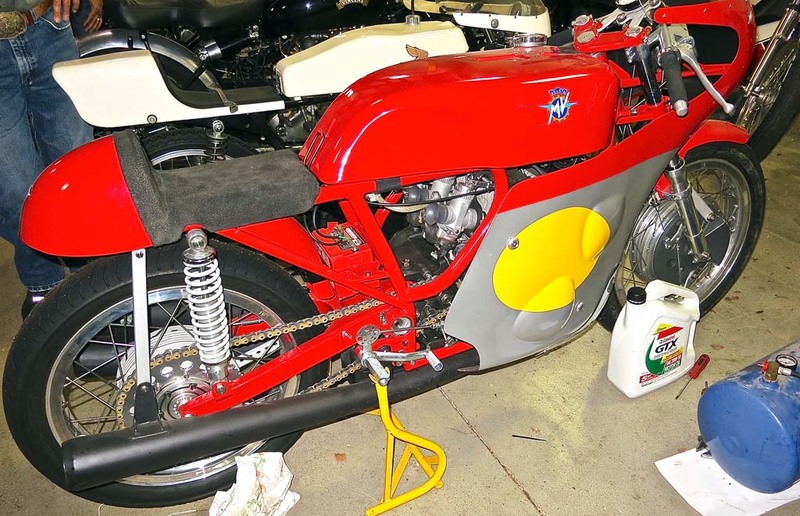 The 350cc version came second and third in the 1961 world championship, behind the MV Four. While Virgil is generous with his time at the museum, he doesn’t spend a lot of it there gloating over his acquisitions. He also has a large lavender farm near by, raises pigs and has “some big pets, Scottish Highland steers and a Zonky.” (Look it up) He also rides more contemporary motorcycles on the road. Elings has also contributed generously to charities, education and medical research. He and Betty Elings Wells donated $12.5 million to UC Santa Barbara, for the California Institute for Science and Innovation building; $2 million to the Las Positas Friendship Park (now Elings Park) in Santa Barbara, and recently $3.5 million to the Center for Theoretical Physics at MIT. Obviously Elings isn’t your average motorcyclist, or collector, and his absent-minded professor demeanor (complete with Einstein hair style) can be misleading. But you can tell his mind is always engaged, that some of his synaptic energies may be elsewhere. He reminds me of that Tom Waits song (“What’s he building in there?”). On the other hand, while he may seem to have more money than God, it’s also obvious that he puts a lot of it to good use. He doesn’t appear to waste any on fashion or frivolity – he’s been wearing the same leathers for 10 years. Just another rider, basically. One with a really enjoyable bank account. 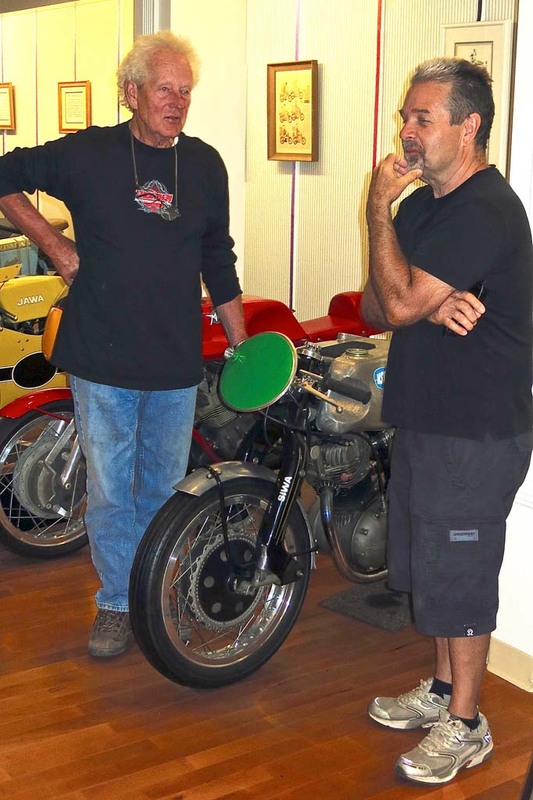 Virgil Elings will serve as Grand Marshal at the annual Central Coast Classic Motorcycle Show & Swap Meet in San Luis Obispo, Calif., Sat. Oct. 11, 2014. Special guest is Craig Vetter. Info at CentralCoastClassicMC.com.